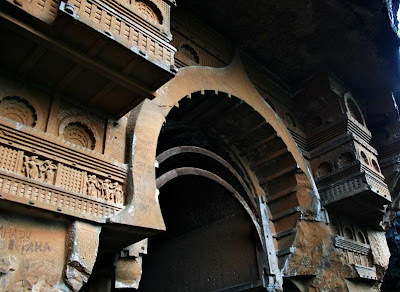 Surprised that I have not even heard of the Kondana caves let alone visit them, I came across them while I was searching for information on how to get to Karjat, which we will soon put up. For now lets go on a journey to the 8 Buddhist caves of the Hinayana Buddhist tradition which is a one hour trek from the Kondane village. The Kondana caves enclose sculptures, vihara, cahitya and stupas, specimens of ancient Buddhist architecture. 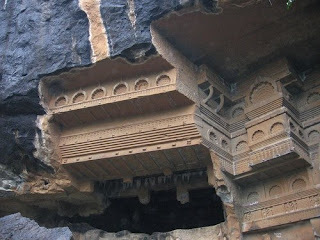 Although there was an earth quake in the early 1900s many stupas, the front entrance and the floor of the caves were damaged. But what remains intact is the beatuful Chaitya that welcomes you to the rock cut caves that were created around 200 BC - 100BC. If your fond of ancient sculpture it sure will fascinate you, the carvings feature dancing men and woman all held together with octagonal pillars. Although now that the masses have visited this cave it seems the trek is quite littered, although there are still some very cool things like rappelling under the waterfall besides the Kondana caves that are organized by various trekking groups a quick Google search will come up with some results. Apart from the lush green that the monsoon provides, you can spend your time getting a cold fresh water massage as you sit under the cascading waterfall. If you plan on doing this trek during another season it is advisable to carry enough drinking water as you wont find any around the place. Take a bus or rickshaw (Rs.150 - Rs.200) from Karjat to Kondivade village and from Kondivade proceed to Kondane or Kharvandi village as from both these villages the Kondana caves are a one hour walk. The other way is from the Ulhas valley, get to Thakurwadi railway station from Pune/Mumbai. From here you can proceed to famous valley of Ulhas River. A road to left from Ulhas river goes straight to Kondhane caves. 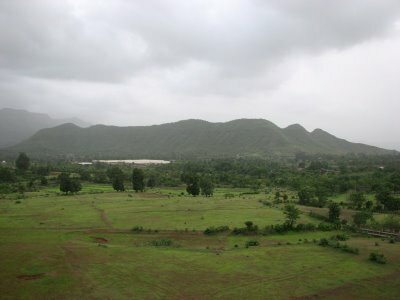 Ulhas valley is a scenic trek besides waterfall and wildflowers. 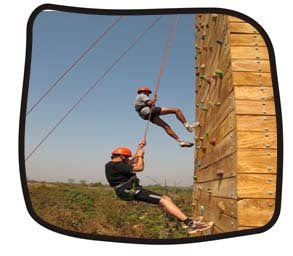 If you want a change from routine and treat your employees to a day full of adventure and learning in Karjat. The training course is organized by Magic Bus, a NGO that looks after the welfare of under privileged children and is also an environmentally conscious group. The Magic Bus center has a fully equipped ropes course, Jacob's ladder and climbing tower with a zip wire. The combination of low and high ropes courses enable participants to grow at the team and individual levels, exploring risk, leadership, communication, problem-solving, and coaching. The staff who will guide you through the course have been trained by C K Chan for five days. Chan is an expert in the field of Rope Course design and facilitation; he is the Managing Director of Adventure Rope (Asia) and also holds past and present positions with the Hong Kong Institute of Adventure Counseling, Hong Kong Society of Sport and Exercise Psychology. Companies like Web Access and Hindustan Construction have visited the Adventure Sport society. This is what Stephen Lobo from Web Access, had to say, "It was an awesome adventure for the 8 of us from Web Access. Although we are Guys and Gals of different ages it was fascinating that we all enjoyed it equally. Some of us overcame our fears of heights and did things we never thought we could. At the end of it, the 1 question all had, when are we coming back?" So why not go ahead and plan a day filled with fun and learning two hours away from Bombay, you would also help Magic Bus care for children who need some loving. As Karjat becomes a more sought after destination, its important to cater to the information needs of people, this was the main reason we started this site. Green Karjat is a complete guide of the things one can do in Karjat, hotels, resorts, adventure activities, restaurants, treks, properties and problems the local people in Karjat face as well. We do hope we can cater to your needs efficiently and have a relaxing time here. If you need any more information do not hesitate, go right ahead and leave us a comment to get a prompt solution to your problem. 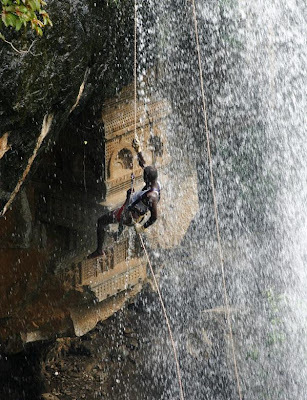 Karjat is situated on a mountainous region that spans over the Bhor ghat, Sahyadris and Western Ghats. Not to mention that it also includes the coastal plains of the Konkan region near Deccan and lies on the banks of the River Ulhas. A picturesque location that consists of a very rich terrain, full of greenery in the monsoons, with waterfalls on virtually every hill uniting to form rivers and streams. 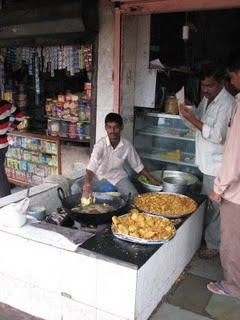 Karjat is famous for its Vada Pau's, this you would realise the moment you step off the train. The Karjat Train Station is an important stop for long distant trains, you have a huge amount of vendors carrying the tasty potato snack up and down the station. In recent times, Karjat has become well know due to the Nitin Desai Film Studio that has been used to churn out a lot of popular Bollywood movies. Many people from Pune and Mumbai have farm houses in Karjat which they use as their weekend getaways. These farmhouses dot the beautiful landscape that attracts trekkers and families on weekend picnics.